Our club has seen fantastic growth in all our junior cricket grades. This has been a result of the efforts of our great volunteers and a well-run club environment encouraging the values of having a go and great team spirit. We value our juniors as they hold the key to future success for our club and the community. We strive to provide them with the correct values, leadership and enjoyment of sport. The Hawks welcome all new members and their families no matter their skill level. The age you are at August 31 this year, determines what age group you are in. For example, if you are 12 at August 31, you are in U13s. Registrations must be done online through the play cricket website. 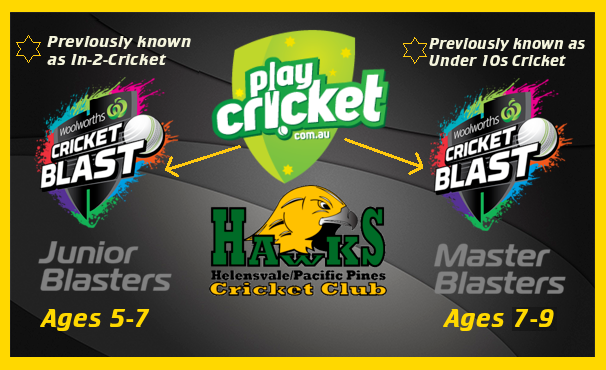 Master Blasters is a super fun, social, safe cricket program for boys & girls under 10 years of age. The Gold coast Under 10’s competition (Master Blasters), runs on Friday nights when participants play across multiple grounds versing other Master Blaster clubs to ensure a great opportunity for kids to start playing club cricket. If a session needs to be cancelled due to bad weather we will endeavour to text all families by 3pm on game day. Team coaches will phone all families to confirm prior to training commencing in early September. We recommend that all players in age groups other than Woolworths Blasters have their own proper fitting equipment. The club will provide general equipment kit bags to the age groups, however we cannot guarantee that the equipment will fit all kids properly. As a minimum, ALL kids should have their own proper fitting helmet and protective box. Our club philosophy for kids in these age groups is participation. We want and will strive to ensure that all kids get an equal opportunity to showcase their skills throughout the whole season. While we acknowledge that the competition we play in does record wins and losses and operates a finals system for age groups starting from the U12s, our priority remains the skills development of all kids. We believe it becomes increasingly important in these age groups for kids to start developing their own set of skills as we start to prepare them for senior cricket. This gives rise to team structure becoming more prevalent. We are absolutely mindful of the importance of each player having a contributing role to play within their team but there are no guarantees given on equal participation in these age groups. Some kids in these age groups may even be given the opportunity to play senior cricket during the season (must be at least 14 years of age) if it is considered appropriate for their development. Places in each age group are filled on a first-in basis. Getting the perfect number of kids for each age group is a challenge for every cricket club. Unfortunately we can’t guarantee any outcome except that we will be open and honest about what opportunity we can offer your child to play cricket with us. If for some reason we can’t provide a spot in the team of your choice, we will endeavour to find an alternative opportunity for your child. To avoid disappointment, sign on sooner rather than later. A club’s strength is in its members’ willingness to help. We are always in need of more volunteers (including team managers and assistant coaches) to help enhance the experience we provide for our juniors. Whether or not you currently hold coaching qualifications, we are very interested in taking on anyone willing to help. We are also in need of several volunteer coaches for our ever-growing Woolworths Blasters program. If you can help, please contact our junior vice-president Shawn Riddell on 0457 875 308.
skill building for 5 to 7 year olds. Shirt (with name on back) and Big Bash Hat. Game based T20 small field cricket. Run on Friday nights, under lights. Fees cover all game costs.